I've been struggling to find something to bake all week. Monday is family day in Ontario (and other parts of Canada) so I kind of wanted to do something family-ish, which to me means breakfast :). When I was younger we always ate dinner as a family, but it was the special occasions that we enjoyed breakfast together. My Mother is awesome at making a great breakfast (as well as lunch and dinner :)). Although I wasn't going to make an entire meal, I did want to bake something that everyone would enjoy. But most recipes I looked at just seemed to rich, too indulgent. I was feeling a little healthier. Normally, I tend to lean a little to the healthy side when baking. Often reducing unnecessary sugars and fats. The only exceptions are when I am baking for someone else or a special occasion. Not to mention that if I did proceed with all indulgent all the time I would face accusations of caloric overload since I “make” people eat what I bake (apparently leaving something on the counter is the same as “make,” I'm obviously quite strong in the Force). 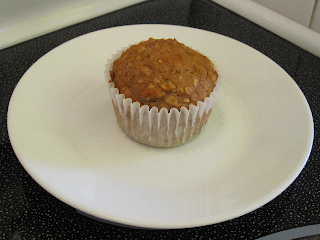 So with the equation: Family + Breakfast + Healthy firmly in hand I came to an answer of Applesauce Oatmeal Muffins. Like most muffin recipes this one comes together lightning fast. I didn't change much other than using a fifty-fifty mix of whole wheat and white flour, tossing in some nutmeg (Apples = Nutmeg), omitting the topping and adding the cinnamon directly to the batter (only because I failed to read the entire recipe before starting :)). I also went the extra step and diced up some apple, dropping a few pieces into each muffin tin. Nope didn't change much (I suppose). My biggest change was to the process, and this may have been my downfall. The original recipe says to soak the oats in milk for an hour before using. I wanted to speed this up as well as eliminate some of chewiness of the oats, so I decided to heat the milk to a boil before adding it to the oats. I would essentially be cooking the oats before adding them. When the muffins came out of the oven they smelled great but as we tried to remove the wrappers a problem emerged. They clung to the muffins like dirt to Pig-Pen. I'm pretty sure it's because cooked oats are quite sticky (something that hadn't occured to me at the time). Unless you're not using paper liners, I would not heat the milk first. The other possibility for the muffins sticking may lie with the liners themselves. This is the first time I used these specific ones and their texture does seem a bit “rougher.” Further investigation might be required :). However, the muffin's flavour was its saving grace. The spices were nice and balanced, the sweetness was light, and the flavour of the applesauce was subtle. But the star was the texture and taste of the apple pieces, giving the muffins the extra kick they needed. They would have been a bit bland if not for this addition. Overall, it was like eating a nice simple spiced apple oatmeal. The muffins were also soft, with just the right amount of chew and zero grittiness from the whole wheat flour or the oats. No doubt because I cut the whole wheat flour in half and absent mindedly cooked the oats :). I definitely enjoyed the flavour of these muffins enough to want to try again. They're a great alternative to Bran Muffins (my favourite) since they also have mild flavours that work so wonderfully with breakfast and coffee. However, next time I'm going to either omit the wrappers (and grease the pan pretty heavily :)) or follow instructions. You see, it's not that I'm adverse to instruction, it's that I don't like being told what to do :). P.S. If it was the wrappers they live in fear of my lighter :). 1/2 granny smith or other baking apple), cored and diced into 1/2 inch cubes. Preheat oven to 400F and grease a standard muffin pan or line with paper wrappers. In a medium bowl add oats and milk and allow to stand for an hour -- alternatively you can take the risk and heat the milk to a boil as I did, but I would definitely not use the paper liners if you do. In this case let stand for 20 minutes. However, the listed hour wait time seems excessive, use your own judgement for when the oats are soft enough. In a small bowl add both flours, baking powder, baking soda, cinnamon, salt and nutmeg. Whisk to combine. Add applesauce and egg whites to oat-milk mixture (when ready) and mix until completely combined. Add sugar and stir to combine. Add dry ingredients to wet, and mix until just incorporated, being sure not to over mix. Add approxamately 1/3 cup of batter to prepared muffin tins. Drop a few pieces of the diced apple into each tin, and top with another 1/3 cup of batter. Bake for 20 to 25 minutes or until toothpick comes out clean (this took me 20 minutes). Allow to cool in pan on rack for 10 minutes before removing and eating. Hi Ellie, thanks for posting :). It's always nice to know that my strange sense of humour is appreciated by some :). Hope the recipe turns out well should you attempt it. Those apple muffins look good, but I took a look at your bran muffin recipe and it looks even better. They looked nice and dark and kind of grainy. Sorry to steal the thunder from the applesauce muffins, but did you ever try the bran muffin recipe from Cook's Illustrated/Marcy Goldman? I loved this one. I actually remember when you originally posted it and I immediately bookmarked the recipe. When I was trying to figure out what Bran Muffins I wanted to make, I decided to go with the ones with the least amount of ingredients and the most wheat bran. However, yours is at the top of my Bran Muffin list :), since the recipes you call your favourites usually end up being mine as well. And no thunder stolen :), these muffins are well aware that they can't compete with the Bran Muffins :).